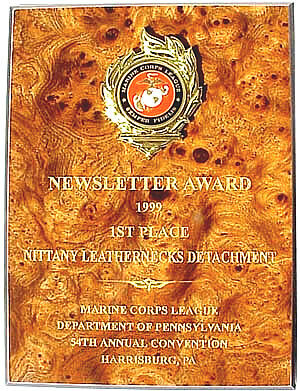 This plaque was presented to our detachment as the 1999 First Place Newsletter Award by the Marine Corps League, Dept. of Pennsylvania, at the 54th. Convention in Harrisburg. To preserve USMC history and historical websites, we encourage you to also visit the VMF-112 website, dedicated to the Marine pilots who served on Guadalcanal during WWII.